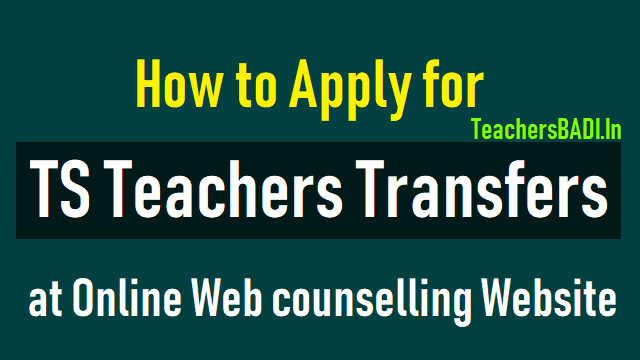 How to Apply Online in TS Teachers Transfers Web counselling Website 2018 by User Manual: How to Apply for TS Teachers Transfers 2018 at Web counselling Website 2018 by User Manual, How to Fill the TS Teachers Transfers 2018 Online Application by using the User Manual Document. How to apply for Online TS Teachers Transfers 2018, How to Register in TS Teachers Transfers Website, Teachers Transfers Registration Process, How to Submit the Telangana Teachers Transfers Online application Form, Online applying Procedure for TS Transfers transfers 2018, Step by step Online application form filling procedure for TS Teachers Transfers 2018. How to apply Online for TS Teachers Transfers 2018. Download the TS Teachers Transfers 2018 User Guide. technology for solution in Teachers transfers there by bringing in transparency at every stage of teacher Transfers and for quick turn-around-time to the process. Main objective of this User Manual document , is to explain the various steps involved in teachers transfers for end user(Teachers ) . This application is given to Teachers to fill in their data to rule out discrepancies. The scope of this User Manual document is to explain the process of capturing Teacher Information for processing transfers. user need to Send mail with registered Mobile number. 1. First Login to through the link of Transfers Web counselling website: http://transfers.cdse.telangana.gov.in. Then, TS Teachers Transfers 2018 Web Counselling Website is displayed. 2. In this website, Click on 'Service' from the menu Tab. 3. In this Service tab, Select 'Teacher Transfer' from the drop down menu. 4. Now, Teachers Transfers Web Page will be displayed. 5. Then, Select "New Entry " from this web page. 7. In this New Entry Page, Enter the Mobile Number (Valid number), OTP will be sent to this number. Enter the Treasury Id and Aadhaar ID. Then, Click on Submit. 8. On click 'Submit' an OTP is generated and sent to the mobile number entered. 9. Enter the OTP received on your mobile number and click 'Submit'. 10. Web Page will be redirected to Teacher details page. Enter Teacher details from Teachers at "Teacher details page"
8. Details entered will be saved successfully and Transaction ID is displayed as shown below. Note the transaction ID for future reference. This User manual document is meant for usage by the Department of School Education team used for Teachers Transfers and. Any changes made to the requirements in future shall have to go through a formal change approval process, wherever necessary and shall not make any alterations without the permission of the client and the development team.